We will be holding an indoor draw competition on the evening of Thursday 2nd April. We want as many men, especially those signed up for the Premier League, to help find our best indoor draw bowler. There will be prizes on offer plus the results will be used to help selected teams for the forthcoming Premier League. Please either sign up or turn up. Five teams entered for the one-day event. The draw was held on Friday afternoon and witnessed by Patrick Mok. Click here to see the team list and schedule. The Section will organise the Club Mini Fours one-day tournament on Sunday 15th December and Sunday 5th January for Men and Ladies members respectively. The format will resemble the Aitkenhead Shield co-organised by HKLBA annually. Prizemoney will be offered. And the winning team will be invited, conditions apply, to represent the Club in the Aitkenshield Shield next March. The entries form is now posted at the indoor notice board. Entries fee is only $240 for each team of 4 members. Deadline for men’s entries is 2.00 p.m., Friday 29th November. Deadline for ladies’ entries is 2.00 p.m., Friday 20th December. The annual Club Singles competition will be held in October to December 2015. Members who play for the Club in the 2015 Premier League are eligible to enter. Entries close at 6.00 p.m. on Thursday 25th September. Please see attachment for details. The annual Rooster Fat Choy Cup will be held as usual on the third day of the Lunar New Year, Wednesday 10th February 2016. Registration form will be posted at the indoor green. Please sign up on the form before the deadline 30th January 2016. 2.30 p.m. – Games to be started (indoor & outdoor). If the weather permits then the outdoor green will be open. Food will be served as well. For those who want to play the social game, but do not want to eat, are also welcome to join the fun & games. Please indicate on the column below if you are not EATING but PLAYING. Notice will be taken out on Sunday 5/4/15. You may also email to Frankie or Anne Gately to put your name on the notice board for you. Thank you and hoping to see you all there!! The Easter Fun Game will be held on Sunday 4th April 2015, details are provided in the registration form now posted at the indoor green. Interested members please sign up on the form. This year’s first leg of Friendly game with KCC will take place at the HKFC Indoor Green on Saturday, 28th March. The Section requires six teams of mixed fours to represent the Club. Interested members please sign up in the Section notice board before the deadline on 2pm, Tuesday 24th March . The Committee will determine the line-up after close of entries. Priority to play will be given to members who are currently registered to play for the Club in the Premier League. Friendly Games played on 28 Mar. Photos here. Please note the following rules for national games green booking which will take effect immediately. 1. A member can only book a rink if there is a definite game to be played. For example, round 3 game cannot be booked if round 2 game has not yet been played. However, round 2 game can be booked if round 1 game is “bye”. 2. Booking of rink during rollup period, i.e. Tuesday evening 7 pm to 9 pm and Thursday evening 7 pm to 9 pm will be subject to approval of the Ladies Captain and Men Captain respectively. The captain may assign a rink different from the one requested. 3. If a certain time period is designated for a certain national game (e.g. Sunday morning outdoor green 10 am to 1 pm for Ladies National Single), then players for that nation game will have booking priority for that period. However, booking must be made within 24 hours after the game status is clarified (for example booking for round 3 has to be made within 24 hours after the round 2 game is played). Otherwise the booking priority will be forfeited. 4. If a home game has been rescheduled and the player wants to reserve a rink for the next designated time period, then the player must notify the Green Secretary in order that a rink may be reserved. The player must then notify the Green Secretary after the rescheduled game is played (whether win or lose) so that the reserved rink can be released if the player has lost the rescheduled game. It should be noted that in such case the rink is not booked but only reserved. Other player of the same national game with confirmed result will have priority and can book the reserved rink. Players of other national games will not have priority and so they can only book the rink if it is released after the rescheduled game. 5. Eligible rink booking will be entertained only if request is sent by WhatsApp (97529500) or by email (koonlawnbowl@gmail.com) to the Green Secretary, on a first come first serve basis. Email sent to the old email address of the Green Secretary will not be entertained. 6. To facilitate the booking process, please list all possible rinks in descending priority. If no other priority is shown and the requested rink is not available, then the request will not be counted as an eligible request. 7. The Green Secretary will try his best to administer rink booking according to the above rules but there may be errors and omissions from time to time. Players are asked to bear with oversights and accept apology from the Green Secretary. We are delighted to inform you all that the End of Season Party of the Law Bowl Section will be held in November 8th Sunday 2015 after the Premier League. A lavish, heavily subsidized buffet will be offered. There will be fun games and prize presentation of different section competitions. Yours spouse, partner and family members are welcome. Do come and share the great fun and excellent food of this Party! Enrolment form will be posted 29th Sept. at Indoor board. The section is preparing to provide one bowling pant (in track suit style) to those who are currently playing or are registered Reserves in the current Premier league. Please note that the restrictions stated in the Section Notice dated 26 May 2015 will apply. From time to time the outdoor green is open on days or hours that it would normally be closed. These are special considerations granted by management, upon request from the Section, to help ease the pressure of the section players for playing league games, national games and special section functions such as club pairs. Management does not allow section members to perform training or practice on these days/hours as the outdoor green is supposed to be closed for the grass to recover from heavy usage. Section members are advised to practice during normal opening hours and also during organised practice evenings. Entries for I enclose the entry form of Mixed Triples 2015 for your action. Club registration deadline at the Indoor Notice Board is 6 pm THURSDAY 10th Sept 2015. Entries for 廣州日航酒店盃 are now open. New section bowl bags are ready for your collection. Please note that only those who are currently playing or are registered Reserves in the current premier league will be given these bowl bags and each person will be given two number two-wood bowls bags and one number three-wood bowls bag Please note that the restrictions stated in the Section Notice dated 26th May 2015 will apply. The General Committee are proposing to update the bye-laws of all the sections. During this procedure the opportunity will arise for amendments to be made to reflect changes proposed by the section committees. We would like to receive from you any comments or proposed changes that you would like the Section Committee to consider for amendment or addition. The current version of the Section Bye-laws can be found under “”about us”” on the Section website. Please respond “”reply All”” to this e mail and advise us of any such matters you wish to be considered, before the 14th August 2015. The Lawn Bowls Section will organize The Club Unisex Triples one-day tournament on Thursday, 3rd September, the public holiday . Prize money and lunch subsidy will be offered. The winners will be invited to represent the Club, conditions apply, in the 2015 IRC Invitation Triples. Please read details in the attachment. Interested members please form your own team and enter your team on the entries form posted at the Indoor Green from 1 August Saturday. Dear All, Section Members, Please see Notice below from HKLBA. If you wish the Committee to nominate you for these posts, which are for both genders, please “‘reply All “” to the Committee on or before Thursday 3rd September 2015. Voting rights will be in accordance with the HKLBA Articles of Association. Royal Bangkok Sports Club of Bangkok will have the 1st International Triples Open from 8-11 Oct. 2015 at Bangkok. Entry form already posted at Indoor Green notice board. RBSC will limit the tournament to only total 20 teams, first come first served basis. Entries for I enclose the entry form of Nong’s National Singles Championships 2015 for your action. Club registration deadline at the Indoor Notice Board is 6 pm THURSDAY 06th Aug 2015. Dear All Section Members, HKLBA has now given HKFC the opportunity to enter teams in the Classic Carnival which will now be held at only KCC on the revised dates of 5 continuous days from Wed 4th Nov to Monday 9th Nov. 2015. The original invitation showing the previous dates and conditions of entry is provided below together with attached DRAFT Schedule of the Event showing the revised dates. If you wish to form your own teams representing HKFC and are willing to pay yourselves the required entry fee of HK$8,000 per team, please respond by “reply All” to this e mail providing the names of your players in their teams before 12.00 noon on Thursday 6th August 2015. Submission to HKLBA of your teams and players will be subject to the approval of the LBS Committee. Sorry for the urgency. Thank you for all your support , 48 entries were received , 24 players are drawn to play and 8 players are drawn to the reserve list, with the kind assistance of C S Suen and Bernard at the Indoor Green. Thank you for all your support , 45 entries were received , 32 players are drawn to play and 8 players are drawn to the reserve list, with the kind assistance of Patrick Mok and Bernard at the Indoor Green. Due to unexpected reasons, the Convenor of CCC, Tony Chok, has requested to change the date of the friendly game to SATURDAY 22nd AUGUST 2015. Our section committee members had a discussion and we agreed to the change the date as it is only a friendly game. Entries for I enclose the entry form of 2-4-2 Pairs Competition 2015 for your action. Club registration deadline at the Indoor Notice Board is 6 pm THURSDAY 30th July 2015. – The section will not distribute new club shirts to those who are restricted by the Notice Dated 26th May 2015 of Section Policy Statement regarding bowling activity . For and on behalf of the Lawn Bowls Section Committee. The Section will organize the “Saturday Social Game” in coming 4 weeks, on Saturday July 11th, 18th, Aug 1st and 8th respectively. All Section Members are welcome. No. of players are limited to 36, first come first serve. Please sign up at the Indoor Green notice on/before every Friday 6 pm. thus we can arrange line up in advance. 30% of the total entry fee. Game Format : Will be decided base on no of entrants. The annual summer friendly match with CCC will take place at Hong Kong Football Club Indoor Green on Saturday, 15th Aug 2015. The Section requires six teams of mixed fours, 24 members to represent the club. Interested members please sign up in the entry form posted at the Indoor green. Some photos from the Sunday Social Game on 21Jun in Photo Gallery. We shall summarize the result and present to Management. This is to confirm that 20Jun, being a holiday, will have the outdoor green open at 10am. This is already shown in the June’s Green Schedule posted on the Notice Boards and the website. Please be reminded that coming Sunday 21 June will be the last round of the Sunday Social Game. Notice of Section Policy Statement regarding bowling activity 26th May 2015. 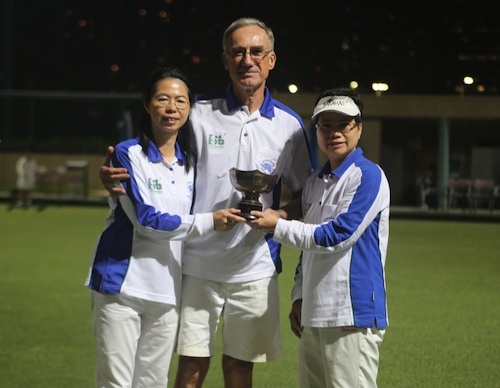 In accordance with a decision made by the General Committee of the HKFC at its Meeting held on Monday 18th May 2015, the Lawn Bowls Section Committee has been directed to issue immediately the following Section Policy Statement. 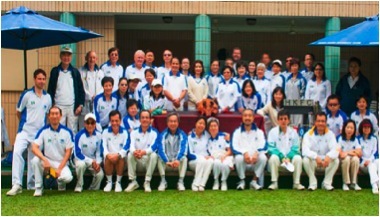 Persons who are Members of HKFC or members of the Lawn Bowls Section who actively play(ed) lawn bowls in any National League games organised by the Hong Kong Lawn Bowls Association (HKLBA), during the most recent calendar year and/or the current calendar year as representatives of bowling clubs other than HKFC and/or the Hong Kong Youth Development Team (HKYDT), shall have the following restrictions applied. 1. Such Persons shall not be entitled to receive any item of lawn bowls kit or uniform issued, subsequent to the date of this Notice, by the Lawn Bowls Section. 2. 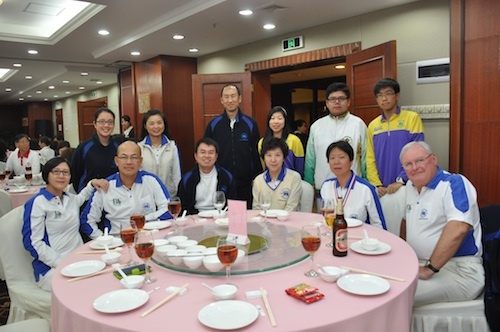 Such Persons shall not be entitled to enter any National Championships/ Competitions, organised by HKLBA, the entry date of which is subsequent to the date of this Notice, as representatives of HKFC and shall not be entitled to nominate any of the HKFC’s bowling facilities as their home green in any competition they may subsequently enter as representatives of other clubs. 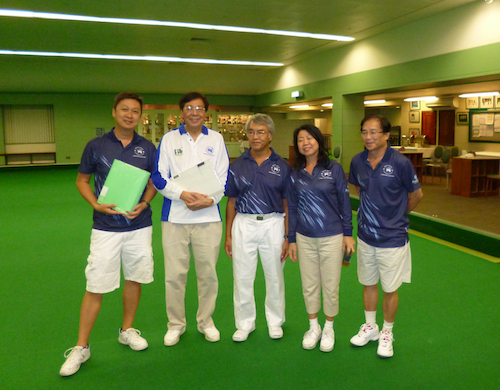 The Lawn Bowls Section Committee wishes to encourage all bowlers to actively support the HKFC by participating in National League Games as a representative of HKFC. In the event of Such Persons demonstrating, by their actions and long term written commitments to support the HKFC by representing only HKFC in National League games, they may, subject to the approval of the General Committee, be relieved of the above restrictions. By order of the Committee of the Lawn Bowls Section. Entries for Men’s and Women’s National Indoor Pairs Competitions are now open. Club registration deadline at the Indoor Notice Board is 6 pm, Thursday 04th June 2015. 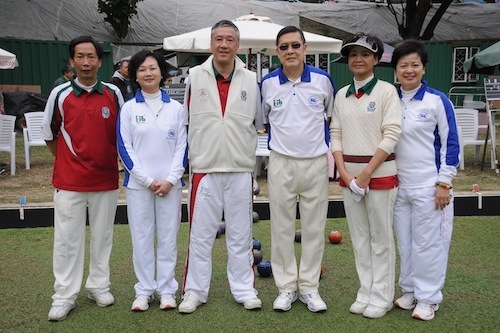 The Chinese Multi Bowls Association is organizing a nation-wide China Lawn Bowls League to commence in May 2015. All clubs in China including Hong Kong and Macau are invited to join. The league venue will be Bijiashen Park in Shenzhen. The Committee has resolved to support this league by sending one team of men and one team of ladies to represent our Club should there be a sufficient number of members signing up. Each team will play two matches of 2-bowl triples on one Sunday each month. Subject to the number of teams enrolled, the league is expected to last for 7 months to up to 14 months in case of double round-robin. Details provided by the organizer are attached. The Section will be responsible for the annual subscription (RMB1,000) and the league entries fee of RMB2,000 per team. Members have to arrange their own transportation at their own cost. Please find attached the allocation of players to the 5 Premier League teams and the reserve list. It is very pleasing to have 89 men members signed up to be available to take part in this years Premier League. If there is anyone not currently on the list who would like to be considered for games in the Premier League please let me know and I will add you to the list. The full league starts next weekend on Saturday 25 April, but this weekend the E team will play their first game at our Indoor green. The objective I have for the Club this year is to come away with at least one trophy and for the A team to get more points this year compared to last year and finish above the very credible position of third that was achieved last year. In addition, I want us all to enjoy our bowls and work together to improve the bowling ability and results of both individuals and the club. (1) Four T-shirts to those who signed and would be playing for the section in the coming Premier League. (2) Two T-shirts to those who will only play National games, but not league games, for the section. (3) Two T-shirts to those who stay with the section and are not playing bowls at the moment. Entries for Men & Women’s National Triples Competition 2015 are now open. Club registration deadline at the Indoor Notice Board is 6 pm Thursday, 9th April 2015. Entries for Mixed Fours Competition 2015 are now open. Club registration deadline at the Indoor Notice Board is 6 pm Thursday, 9th April 2015. Thank you. Bookings for the Outdoor Green on 22 and 29 March for National competitions MUST be played within the time frame of 10 am to 7 pm. Please be advised that the Outdoor Green will be open for National competition on the 22 & 29 March 2015. Those competing in a National competition can use the Outdoor Green on a first-come, first-served basis. 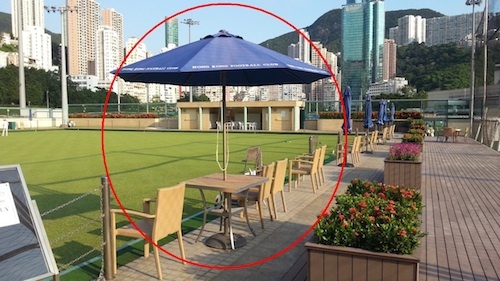 Public Greens: If you have already booked a public green, you can switch back to the HKFC Outdoor Green (home green), and the Section will reimburse you the public green booking fee. This year’s first leg of Friendly game with KCC will take place at the HKFC Indoor Green on Saturday, 28th March. The Section requires six teams of mixed fours to represent the Club. Interested members please sign up in the Section notice board before the deadline on 2pm, Tuesday 24th March . The Committee will determine the line-up after close of entries. Priority to play will be given to members who are currently registered to play for the Club in the Premier League. The Committee are currently seeking 2-3 Section members to be part of a new “Sponsorship Sub-committee” for the Lawn Bowls Section. Reporting to the LBS Committee, the subcommittee will be responsible for seeking and maintaining sponsorship agreements, and representing the Lawn Bowls Section to the wider community. Dear Section Members, We are pleased to announce the result of the Election of Officers for 2015/16. The new committee will hold its first committee meeting on Monday 9 March 2015. Thank you to all those members who were available to attend this year’s AGM, and a special thank you to Derek Wyllie, C S Suen and Celena Kwok for volunteering to help out at the AGM. 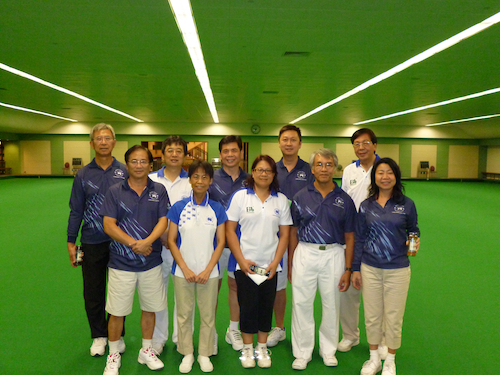 This is a gentle reminder of the AGM of the Lawn Bowls Section held today, Friday 6 March 2015 at 7 pm, 1st Floor, Lockhart Room. On arrival, please confirm your attendance with Derek Wyllie and C S Suen at the Register table. Doors will open from 6.30 pm. The AGM will commence at 7 pm sharp (having been satisfied of a quorum). Attached is the Agenda for your information. Light refreshments will be served immediately after the AGM. The Nominations of Officers list was removed from the LBS Notice Board last Friday, 27 February 2015 at 7 pm, by Bernard Young and witnessed by Mike Worth. I attach herewith the Agenda which includes the typed-up version of Nominations of Officers for 2015/16. The original is also attached. (*Proposers are required to give a brief statement at the AGM of their reasons in support) REMINDER: The AGM will be held this Friday 6 March 2015 at 7 pm, 1st Floor, Lockhart Room, HKFC. A further and final reminder will be sent to all members 24 hours before the AGM. The rinks will be assigned on a first-come, first-served basis. In order to facilitate your booking, without having to exchange emails back and forth, you can assign priority to the rinks – such as “Indoor Rink 3,4,5,2,1,6”. If rinks 3 and 4 are booked, then rink 5 will be assigned to you. You will receive confirmation as to which rink will be booked for you as soon as your reservation is processed. If your email is sent on behalf of another member, please specify who the member is. Please note that self-practice rink bookings will still go through the Sports Desk, however National Games will have priority over self-practice sessions. Photos in Photo Gallery. Thanks Mike for providing the photos. Rooster Fat Choy Cup played on 21Feb. Photos at Photo Album. The Annual General Meeting of the Lawn Bowls Section will be held in the Lockhart Room, 2nd Floor, of the Club on Friday, 6 March 2015 at 7pm. The Agenda will include the presentation of annual reports of existing officers of the committee, consideration of the section’s annual accounts, and the election of the officers for the coming year. All Section members are invited and encouraged to take part in the nomination of the officers (with the exception of General Committee Representative) to be serving on the Lawn Bowls Section Committee and to attend the AGM in order to take part in the voting. However, in accordance with the Clause 9.14 of the Section Bye-laws, any Section Member in arrears with their subscriptions or Section Levy, or any Section Member who is suspended from the Club or the Lawn Bowls Section are not eligible to nominate or second officers. By the same token, they are not allowed to vote at the AGM. Nomination and election of Committee Officers 1. Nomination by Section Members of the officers shall be carried out in accordance with the Section’s Bye-laws. Procedures are documented in the other attachment and nomination forms are made available on the notice board. 2. The officers will be elected by Section Members who are present at the AGM and are eligible to vote according to Clause 9.14 in the Bye-laws. The voting will be conducted by ballots and will be monitored by the Chairman and two appointed scrutinizers by the Chairman. 3. The Lawn Bowls Section General Committee Representative will be nominated and endorsed at the AGM and the Honorary Secretary will be notified in compliance with the Articles of the Association of the Club for nomination and election at the next Annual General Meeting of the Club. 4. Nominations of Officers using the appropriate forms will be accepted up to seven (7) days before the proposed date and time for commencement of the AGM. Agenda In accordance with Clause 8.5 of the Section’s Bye-laws, issues and items to be proposed for inclusion into the Agenda of the AGM must be submitted in writing to the Secretary at least seven (7) days (ie, Friday 27 February 2015 at 7 pm) before the date and starting time of the AGM. Please be informed that the committee confirmed to subsidy 50% of entry fee for one men’s team and 50% of entry fee for one women’s team, if any prize money gained then 50% of the awarded money has to be returned to the section. Please note that they have to enter as a team of four. If more than one team, then a qualified game will be arranged. Closing date of entry is extended to 15 Feb 2015. Interested members please enter your team on the entry form posted at the indoor green notice board. Time to sign up to the Premier League. The triples league is coming to an end and the entry for the number of sides the Club wishes to enter into the Premier league will have to be made to the HKLBA by 23 February 2015. The fixtures will take place between 18 April and 4 July 2015 for the first half and between 22 August and 30 October 2015 for the second half. In order to ensure we enter the right number of teams we would invite members to sign up now for the Premier league. We now have 150 members in the Men’s section and in the last Premier League we managed to get 89 Men to participate in the league. Please highlight where your availability, as you know it today, and any preferences you would like to highlight. The Committee and your Men’s Captain are asking that we attempt to get more men signed up and participating this year in the league. That may enable us to enter more sides but if not at least we would have a larger supply of players to ensure we can always put out a competitive side. For those that cannot commit to playing every week we welcome those members to sign up as a reserve. Even if you are only available for a few weekend games it helps us know who is available and willing to support the section in the league. This is a great representation of our Club, so if you’re available, please go along to support our HKFC teams! On behalf of the Lawn Bowls Section, we wish them all the best. The Section will organise the Club Mini Fours one-day tournament on Sunday 8th February, Sunday for Men and Ladies members respectively. Prize money will be offered. And the winning team will be invited, conditions apply, to represent the Club in the Aitkenshield Shield next March & April. Deadline for entries is 18.00 p.m., Tuesday 27th January 2015. Entries for National Indoor Singles are now open. Club registration deadline at the Indoor Notice Board is Thursday, 29th January 2015. Drinks : First drink will be on the section. Sign up at the indoor Green on/before Friday 19th December 2014. 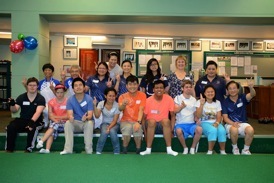 On 1 July the Lawn Bowls Section hosted a highly enjoyable afternoon of bowls for the special needs children from the Youth Empowerment Service (YES). Also in attendance were children from The Rock and the Nisbitt Centre. The afternoon began with coaching by C S Suen followed by fun games assisted by section members. Twelve children and their parents participated, and co-organiser Penny Mountain said the children had a great time and are looking forward to similar events in the future. The fun day concluded with afternoon tea and prizes. A special thanks to Bernard, C S Suen, Yvonne, Irene and Shirley for their assistance, and also those who turned up on the day to meet the children. Thank you all for your support. 38 entries were received. 32 names are drawn to play with 6 names in the reserve list, thanks to CK Wong for his assistance in the draw. Please notify Walter for withdrawals. We will gather at the Club on the day to travel together up to HKCC. More details nearer the time. The month of July will feature a pair of Intra-Club Bowling Challenges with “Friendly” matches set on the Thursday nights of 10 and 17 July. The Bowling Interest Group balls will be first up with a 10-pin friendly match on 10 July as we will get a chance to strike and spare, and mingle and learn with our Club counterparts. All ladies bowlers will be awarded a 10-pin handicap in the friendly competition. Bowlers will have a brief practice beginning at 7 pm and the Friendly will officially commence at 7:30 pm. It will be a fun night to get the two groups of Club bowlers together on back-to-back Thursdays in July to learn more about the intricacies of the game. We will play host on 17 July in the second of the “Friendly” matches and the Club’s 10-pin team will have a chance to learn much more about lawn bowls. The competition will begin promptly at 7 pm. Interested members please sign up at the indoor green notice board before 1pm Friday 4th July. 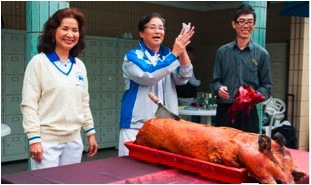 We are organising a “Pig Cutting Ceremony” on 26/4/14. Kindly make yourself available for this special day. Please see explanation below: 1.30 p.m. — Ceremony to be held 2.30 p.m. – Games to be started (indoor & outdoor). If the weather permits then the outdoor green will be open. Food will be served as well. For those who want to play the social game, but do not want to eat, are also welcome to join the fun & games. Please indicate on the column below if you are not EATING but PLAYING. Form is already placed at the club indoor notice board. Notice/Form will be taken out on Friday 20/4/13. You may also email Vivek or Anne Gately to put your name on the notice board for you. Kindly find attached the form. Thank you and hoping to see you all there!! Please find herewith the “New Laws of the Sport of Bowls” for your information. This will take effect in two phrases commencing 1 January 2015 as per below. A copy will be placed on the Club Notice Board. 3.3 Choosing the rinks for play If, after the draw for rinks has been made, a player in a competition or game plays on the same rink before the start of play on the day of the competition or game, that player will be disqualified. This does not apply to open tournaments. If a player in a competition or game plays on the same rink on the same day of the competition or game, that player will be disqualified. This does not apply to open tournaments. 5.1.4 Trial Ends Each player must not use more than the number of bowls being used during the game. If a player or an umpire notices that a player is using more than the permitted number of bowls, the defaulting player will lose the right to play any bowls remaining to be played in the trial ends. Hong Kong will adopt this. 6.1.5.6 Portable Groundsheet Hong Kong allows the use of portable groundsheets as an alternative to the fixed groundsheets mentioned in this law. 6.2.6 To gain better grip during adverse weather conditions a player can, before delivering their bowl, lift the mat, turn it over and replace it in its original position. Hong Kong will adopt this. This is a new law and players should always remember that they should ensure that the mat is returned to its original position when turning it over. 7.1 Position on the Mat: “Before delivery a player must be standing on the mat with all or part of at least one foot on the mat. At the moment they deliver the jack or a bowl, the player must have all or part of one foot on or above the mat. Hong Kong will adopt this. This removes the requirement that, on taking up a stance on the mat, a player has to have one foot wholly on the mat. 14.3 Touchers No bowl will become a toucher if it plays onto, or comes into contact with, the jack when the jack is in the ditch. Hong Kong will adopt this. This clarifies that a bowl cannot become a toucher if it comes into contact with a jack that is already in the ditch and that a bowl previously marked as a toucher will remain a toucher if it is played into the ditch and touches the jack again. 20.2 Dead End If the jack and bowls need to be transferred to the opposite end of the rink before the end is replayed, they must be transferred in a way which avoids distracting players on neighbouring rinks. Hong Kong will adopt this. No longer mandatory to carry the bowls up the green after a dead end. 23.3 Deciding the number of shots scored …If a player measures before the process of deciding the number of shots scored starts, the defaulting team will lose the right to play any bowls remaining to be played in that end and the non-defaulting team will deliver their remaining bowls to complete the end. Hong Kong will adopt this. There is now a penalty for measuring, i.e. using equipment to determine the shot, before all the bowls in an end have been played. 32.4.2 Game stoppages Players, however, must not be transferred from one team to another. If players are transferred from one team to another, the defaulting team will forfeit the game to their opponents. Hong Kong will adopt this. This applies for games restarted on the same or a different day. 40.1.9 Players duties — The Skip The duties of the skip will continue to include those duties pertaining to the scorecard. However law 40.1.9 allows Member National Authorities to set an appropriate “Domestic Regulation” for their own domestic play. For all domestic games the duties described in Law 40.1.7, apart from the provision of Law 40.1.7.5, will be transferred to the second player to play in each team. le: Pairs — the Skip; Triples and Fours — the Second.” The skip will continue to be responsible for entering the finish time, signing the card and agreeing the final score with the opponents. Although the changes will not mean widespread alterations to the way we play the sport, I think it is essential that every bowlers in Hong Kong should be fully aware of the changes in the Laws. 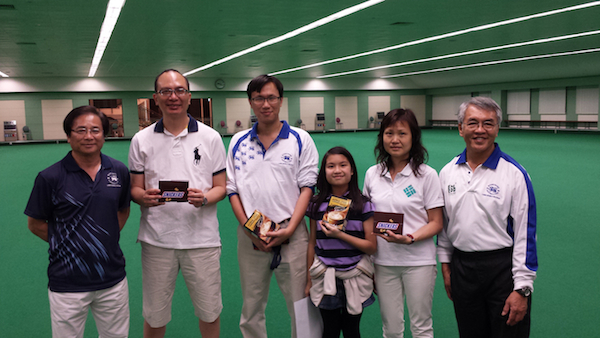 The new law book, as well as the Chinese translated version is now available from the Hong Kong Lawn Bowls Association. Club entries deadline Thursday 11 December 12.00 noon. Club entries deadline Thursday 18 December 12.00 noon. A reminder to all Section members that the Winter League sign-up form has been posted on the Section Notice Board. Those who are interested in participating in the Winter League please sign your name on the form. Please note: closing date is 4 October 2014. The End of Season Dinner sign-up form has been posted on the Section Notice Board. 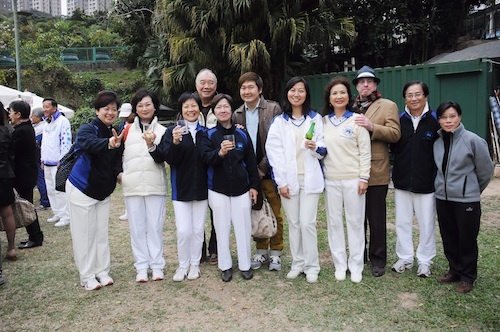 The End of Season Party of the Lawn Bowls Section will be held on 7 November. A lavish, heavily subsidized buffet will be offered – please refer to attached form for more details. NOMINATIONS RECEIVED FOR GENERAL COMMITTEE REPRESENTATIVE Email of 27 August 2014 refers. 1. Nominee: Mike Worth. Proposer: Bernard Young. Seconder: Lydia Yang. 2. Nominee: Walter Kwok. Proposer: Neil Herrington. Seconder: Rita Shek. As there is more than one nomination, an election shall be by ballot and the Chairman of the EGM shall appoint two scrutineers to conduct the ballot. More information re EGM to follow. Nomination results submitted for your information. 42 members signed up for the event. 24 names are drawn to play and 18 drawn to the reserve list, with the kind assistance of Bernard and CS at the Indoor Green. All players are requested to assemble at the Indoor Green at 2pm on Saturday 16th August. If between now and then you become unavailable, please let me know. The annual summer friendly with CCC is now imminent. Details are in the sign-up sheet attached. 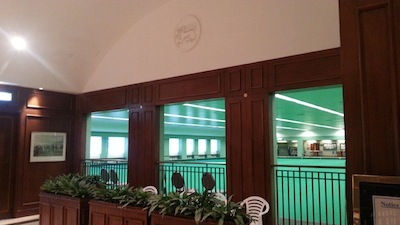 Please put your name on the sheet now posted at the indoor green. The outdoor green will be closed for its summer maintenance by club management from now on. It will re-open for members use on Thursday 14th August. The 2nd Club Unisex Triples one-day tournament will be held on Tuesday, 9th September, the public holiday after the Mid-Autumn Festival. Prize money and lunch subsidy will be offered. The winners will be invited to represent the Club, conditions apply, in the 2014 IRC Invitation Triples. Please read details in the attachment. Interested members please form your own team and enter your team on the entries form posted at the Indoor Green from next Monday. “Bowlsability Fun Day” On 1 July 2014, the Lawn Bowls Section will hold a Bowlsability Fun Day for special needs children from the Youth Empowerment Service (YES ). Yang Memorial Methodist Social Services is an organisation who have set up the YES programme for school leavers over the age of 16 with Special Educational Needs. The Bowlsability Fun Day is a chance for the Lawn Bowls Section to give something back to the community, and hope to make a difference in the lives of the children. The committee have arranged lawn bowls coaching and fun games for them, with light refreshments. The Bowlsability Fun Day will be held on Tuesday 1 July 2014 from 2-5 pm utilising indoor rinks 4-6. If you are around on the day please feel free to drop by to say Hi to the children, and watch them learn to play lawn bowls, maybe even take a photo with them. THE DRAW WAS DONE WITH THE KIND ASSISTANCE OF TERRY (FOR LADIES) AND RAPHAEL (FOR MEN) TODAY. 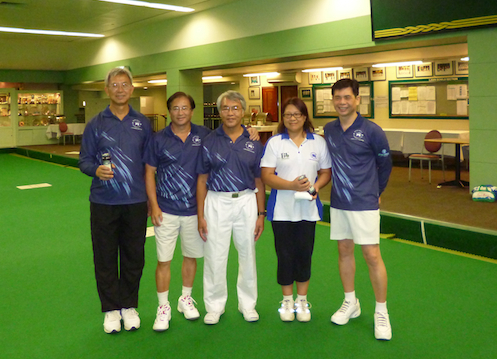 Our HKFC mixed fours team of Danny Ho, SK Ng, Camilla Leung and Winnie Au will be competing at the Filipino Club in the semi-final of the Ronson Au Memorial next Monday (2 June), and to be followed by the Final if successful in the morning. You may wish to go and support your clubmates. Entries are now open for the 2014 Club Pairs competition. 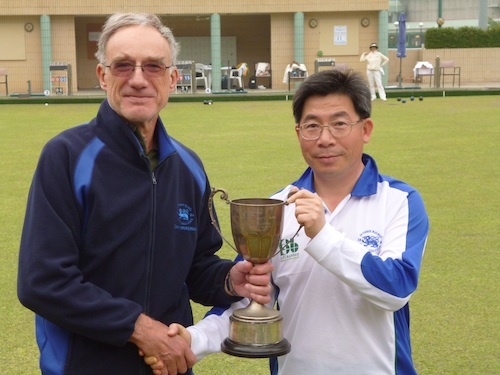 The winners will represent the Club at the annual Hong Kong International Bowls Classic pairs competition in November. Interested members please register your names on the entries form now posted at the indoor green notice board. Deadline is 1pm, Monday 26th May. The Nong’s National Singles Championships are now open for entries. Club deadline is 2pm, Friday 25th April. Register your name on the entries form now posted at the indoor notice board. Nicole Muk, daughter of our Irene Muk, in Sacred Heart Canossian College Lifts Inter-schools Title. Photos here. Social with HK and Melbourne Cricket Clubs HKFC lent a helping hand to HKCC to host their lawn bowls guests from Melbourne Cricket Club today as their bowling green was “temporarily” enlisted as a cricket ground on the public holiday Saturday afternoon. Our dozen bowlers – Daisy, Dorothy, Hannah, Harold, Leo, Louis, Matthew, Philip, Roger, Shirley, Walter and Wanis were mixed with the 20 visitors to form 8 multiple club rinks to play 3 rounds of short games. 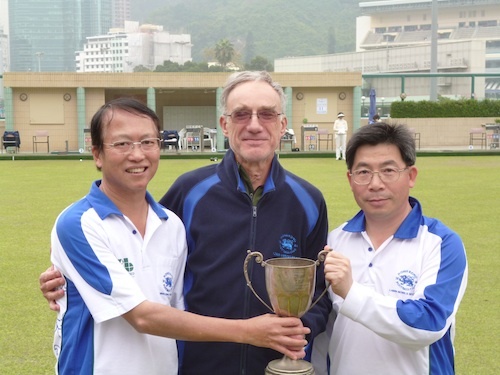 Good idea of Howard and Glyn to make sure every club particularly HKCC has a winner. While on that subject if it matters the rinks of Daisy, Harold, Luby of HKCC and Norm from MCC and Shirley, Matthew, and Lynda and Henri of HKCC came out as the top teams. 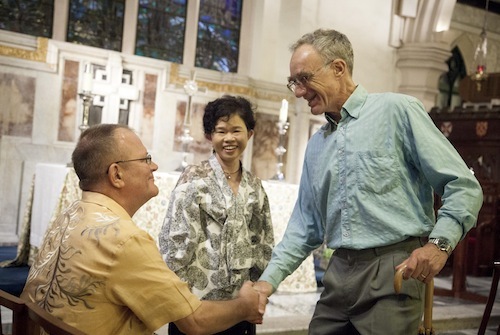 They received a well-earned round of applause as the prize. At the end of the day, it’s about having a good time which we all had. Thanks once again to Glyn for the bottle of red and Norm for their crystal glasses, which Bernard has decided to put them in good use at the next Section function. The Section will organise a one-day club game at the indoor green on Good Friday, 18th April. Details are attached. Entries first-come-first-served. Please sign up at the indoor notice board. Please note that Management has decided to close the outdoor green after the Tiger Bowls tournament from 17th March to 31st March. If any of your national championship home matches have to be re-arranged to a paid venue as a result of the shut down, you may seek reimbursement from the Section via Irene, Treasurer by providing a proper official receipt. Please be advised that all indoor rinks will be used for tiger bowls from 9am to late evening tomorrow. The Section will assist HKCC to jointly host a friendly with visitors from Melbourne Cricket Club on Saturday, 5th April afternoon at our indoor green. We require 12 bowlers to field 4 multi-club mixed teams with each team consisting of bowlers from each club to play 3 rounds of 8 end short game tentatively. Details of rinks composition are to be discussed with HKCC. Light refreshments, tea and coffee will be provided. Drinks will be on members’ own account. Please register your name on the entries form now posted at the indoor green. Deadline is 8.30am, Tuesday 25th March. 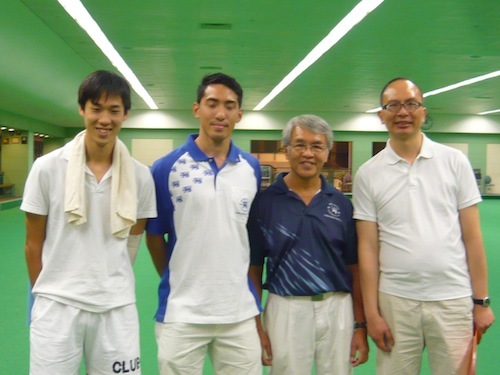 Our Men’s team, with representatives of Edmund Leung, Stephen Chan, CS Suen, Bernard and Stanley Luk, entered the final in the Aitkenhead competition. Unfortunately they lost to TMSA and got the 1st runners-up. They got a silver medal @ and $1,500 as the prize money. 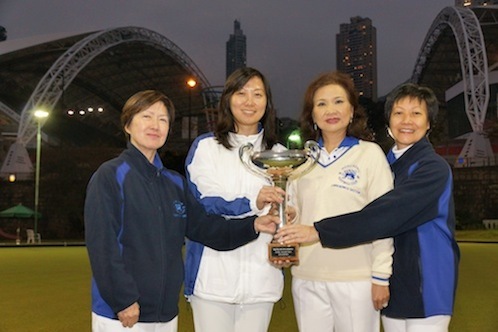 Ladies B becomes the Champion of the Triples League 2013. See photos here. Please kindly remind the members of Lawn Bowls Section that both Indoor and Outdoor greens will close at 4pm on Sunday 16th February due to the staff annual party, many thanks. HKLBA Finals Day schedule on Sun, 23 Feb attached. We have three teams in the finals. Lunch will be provided to all participating finalsts. Other Members who want to buy a lunch coupon please register your name on the form posted at the indoor green before the deadline. Thanks a lot for your great support in the past seasons. The Premier League 2014 will soon begin after the current Triples league which will be ended on 22 Feb 2014. You are being cordially invited to join this league. The sign-up form will be posted on the section notice-board on this Sunday. Please sign up before 16 Feb 14 if you are interested to play in the coming Premier league. You can also register by email. Your support and cooperation are very much appreciated. We would like to inform you that the club management has decided to renovate the outdoor store room after 16 Feb 2014 . We have been advised that all the stuff, including bowling shoes and woods, in the store room will be removed or disposed after the above date. If you have any personal belongings or bowling kits left in the store room, please remove or take them back as early as possible. Please note that the outdoor green will be closed for maintenance between 24 February and 14 March. /expandsub1] 27th January 2014 - CCC's 120th Anniversary Invitation TournamentThe Section received an invite from CCC to particpate in their 120th Anniversary invitation tournament in March. The Committee invited the 2013 Most Valuable and Most Improved Player Awards winners to join its two reps. Our team will make up of Johnny, Irene, Wanis, S K, Dorothy and Raphael. With a view to allow more Members to be able to share the joy and fun of the Chinese New Year at the green, the Committee has revised the format of the day. You will arrive after lunch for a game of bowls in the afternoon starting at 2.00 p.m. Festive food and coffee/tea will be served at the courtesy of the Section. Members who want to join now please enter your name on the form at the indoor notice board. All original entrants have been pre-printed on the registration form. Congratulations to Emmie Wong for taking the title of Ladies’Club Champion 2013. Emmie will join Derek to represent the Club at the Champ of Champs in March. The indoor green was filled with joy and fun on Boxing Day when 36 members came in to join one of the most colourful roll-ups of all year. Bernard was kind enough to organize the proceedings of the day with all bowlers drawn into 2 groups to play two sets of 8-end triples. Daisy started the bowls rolling with a brief opening remark. Before long, the Blue team captained by Thomas won 5 rinks in the first set where the Red team could only manage a tie in one rink by its captain Warren to prevent a total loss. Both teams put aside their bowls, good or bad, after the set for a tea break while Daisy helped picked the luckier ones from a pile of names to receive the Christmas gifts prepared by Bernard. After the lucky draw, the Blue continued to dominate in the second set with again only one Red rink able to score. At the end of the day, Blue was the overall winners and the team happily received the well-deserved prize which was a big box of chocolates from Johnny. Wai Ming achieved the most number of touchers in his games was given a half bottle of wine. Stanley led Anne and Shirley to produce the best rink performance of the day and was named the best rink. Friday 23rd August saw the section host the Royal Bangkok Sports Club’s lawn bowlers to a friendly warm up game in preparation for their triangular tournament with KCC and KBGC. Despite the heavy rains the excellent drainage of our new lawn enabled us to play three rinks and once our visitors had gone the hang of our green we ended up having a very close game. The visiting captain Ken Ho exchanged mementos with our Chairman Roger who confirmed that we were looking forward to a formal Interport fixture in Bangkok this coming December. Thanks to Johnny for all his liaison and coordination work that enabled this event to take place. Roger Photos are in our Gallery in this website. Saturday 17th August saw us host CCC for the Friendly Neighbourhood Trophy which was in the hands of our guests. Six mixed rinks had been organized by Bernard and in proper friendly atmosphere we were able to recapture the Cup by winning 4 rinks to 2 with Wanis, Derek, Terry and James leading their respective rinks to victory. Undoubtedly the advantage of playing on our indoor green proved the crucial point as it was noted that in the 5 times we have played for this cup the home team has been the victor.So the challenge for us next year is to see if we can retain the cup playing away to CCC. My thanks also to Walter for all the pre match organization. Photos are in our Gallery in this website. Thanks to Walter, Bernand and CCC for the photos. Date: 31 May 2013 Venue: Choi Fook Royal Banquet Address: L8, Fortune Metropolis, Hung Hom, Kowloon Time: 7:30 pm Charge: HKD320 / person The Association encourages all prize winners to attend. The sign up sheet has been made available on the notice board and will be taken down by 20 April 2013. If you cannot sign up in person at the Club, please email the Men’s Captain (bernardyounglf@hotmail.com) or the Ladies’ Captain (mcnie@netvigator.com) to sign up on your behalf. Please note that places will be offered on a FIRST COME FIRST SERVED basis. In spite of the very unsettled weather caused by Tropical Storm Jebi the rain abated in time for the HKCC lawn to quickly drain and dry and we were able to play our Social Game on schedule on 2nd August. They had invited us to send seven mixed rinks to play them and there were some excellent performances on both sides. HKCC won four of the rinks but we were able to clinch the aggregate thanks to Hannah, Connie and Neil’s rinks winning handsomely so honours were even. The hospitality we received was first class and a splendid time was had by all who participated which we will be keen to reciprocate. Apparently there is an old trophy ‘The Apple’ that previously existed between our two clubs so we will see if we can find it, or if necessary,replace it in time for the return fixture which should take place later this year after the completion of the Premier League and before the start of the Winter League. Photos are in our Gallery in this website. Thanks to Walter, Mike and Donald for the photos. A pig cutting ceremony was held on 20 April to commemorate the start of the new 2013 Premier League and to wish all our teams good luck with Bernard the Men’s Captain and Daisy the Ladies Captain officiating. The ceremony was followed by a social games in both indoor and outdoor greens. Congratulations to Stanley, C S, Stephen and Edmund for winning the inaugural Club Men’s Mini Fours on Sunday 15th December. The team will be invited to represent the Club at the Aitkenhead Fours in March. Runners-up are Thomas, Patrick, Bernard and K K.
Congratulations to Derek Wyllie for taking the title of Men’sClub Champion 2013. Derek will play for the Club at Hong Kong Champion of Champions Championship next March. If you haven’t registered for the End of Season Party, chop chop, this week is your final opportunity to do so. Apart from celebrating our ladies’ remarkable achievements in the premier league, good food, fun games and lucky draw with generous prizes are on offer. Don’t miss out, Sign up now. See you all there at the Happy Valley Suite on Saturday 23rd. The outdoor green maintenance schedule has been changed to Wed 13/11 — Thu 21/11 as per Management advice. The green will re-open on Friday 22/11. The Club Singles originally scheduled in the evening has been put back to the following week on Friday 29/11. The green will be fully occupied by the Friendly with HKCC on Saturday 23/11 in the afternoon. The outdoor green will be closed for regular maintanence between Monday 11th and Monday 18th in November. The 14th Beginners’ Course was finished on 9 Oct 2013. A short game was arranged by the coach, CS Suen, in that graduation evening. Finally the ladies’ team won. Here attached some photos for your reference. Descriptions of the photos: 1. 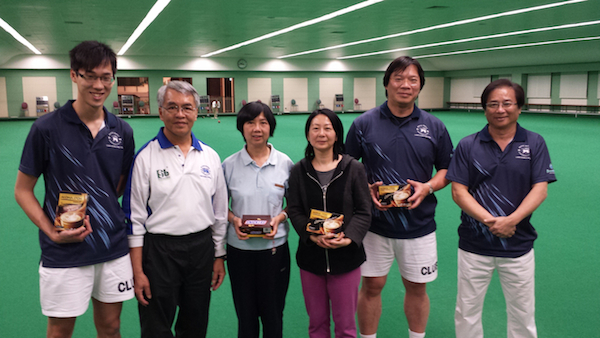 Group photo From left to right Bernard Young, Joyce Chan, Teresa Ng, Telly Chan, Kenneth Wan,Mitchell Chu and coach CS Suen 2. Runners’ up Kenneth, Mitchell and Telly 3. Winners Yvonne, assistant coach, Joyce and Teresa. Please be advised that the Indoor Green (3 rinks) will be used for the Women’s National Indoor Singles Semi-finals and Final from 6.30 p.m. on Friday, 13th September. All section bowlers should have received the new section uniform by now. We would like to remind you that all section bowlers must wear the new uniform during League games and National competitions when you are representing HKFC with effect from 31 Aug 2013, Saturday. Thank you for your attention. Have an enjoyable and fruitful season. 1. Saturday, 24 Aug, 12:30pm to 2:30pm 2. Tuesday, 27 Aug, 6:30pm to 7:30pm 3. Thursday, 29 Aug, 6:30pm to 7:30pmYou may collect your uniform in person or ask your captain or teammates to do so. Any request of changing sizes will be dealt with after all the bowlers have collected their uniform. Please inform Bernard or Walter or by return email if you cannot collect at any of the above times. We will have visitors from the Royal Bangkok Sports Club in Thailand on Friday, 23rd August in the afternoon. A casual rollup will be arranged for the group of about 12 bowlers. Members who like to join please turn up at the outdoor green on the day. No prior registration is necessary. This is a good chance for those of us who are planning to join the inter-port tournament in December to meet the Thai bowlers. Please contact Johnny for more details. Please note two messages below from our Groundsman. The green is scheduled to open at 6.00 p.m. on Friday, 9th August. New Umbrella Table Please note Club Management is going to replace a new set of umbrellas with tables (see the sample of the attached photo) at outdoor green. The new umbrella stands are heavy enough to support the whole set of unit and the old drinks cabinet will then be replaced; in result this can spare more space for the area. Comments are welcome. In view of the unsettled weather, the indoor green has been put on stand-by as a contingency venue for the Section’s friendly game with HKCC tomorrow (Saturday 3rd August) between 2.30 p.m. and 6.30 p.m. A decision will be made by 12.00 noon. For members included in the HKCC Friendly’s line-up, please remain contactable by email or by mobile telephone as updates will be issued. For members who plan to come in for a roll-up, please check with the Sports Desk or Walter (67926182) beforehand. The Section wishes to thank you for your understanding. 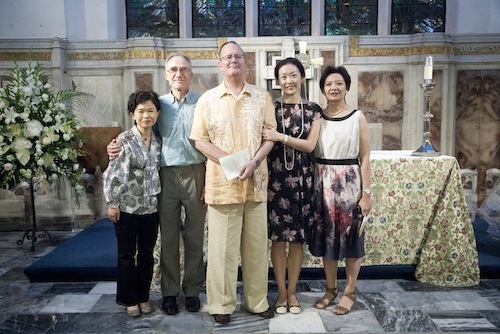 Lydia, Priscilla and Roger joined Bill and Shuang at St John’s Cathedral on 20th July to celebrate their 10th wedding anniversary and a renewal of their wedding vows – good to see Bill looking so well and participating in this very moving ceremony. 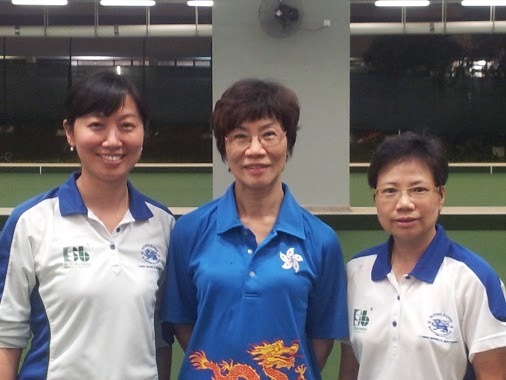 We are proud to introduce three of our lovely ladies, Dorothy Yu, Grace Chu and Emmie Wong who are currently in the squad training to represent Hong Kong in the forthcoming HK Classics and the Japan Open tournaments. Good Luck Ladies! The draw for the 37 entries received for the friendly game with Hong Kong Cricket Club has taken place today, thanks to Daisy and Walter. The 24 successful names and the order of reserves are shown in the attachment. Line-up of the six mixed rinks will be issued next week. Meanwhile, please email hkfcbowls@gmail.com for any withdrawals. The annual Club Singles competition will be held in October to December 2013. Members who play for the Club in the 2013 Premier League are eligible to enter. Entries fee $80. Prizemoney will be offered. Entries close at 2.00 p.m. on Wednesday 18th September. Thank you for your support for the two friendlies with HKCC and CCC respectively in August. The response has been very positive, with 33 entries received for the away game at HKCC on 3/8 and 41 for the home game at our indoor green on 17/8 so far. I am checking with HKCC to see if they would do 7 or even 8 rinks so that more of us can go. Meanwhile, the Committee has developed the following guidelines for determining the line-up of the two friendlies. 1. Open ballots will be conducted at the Indoor Green to determine the names to be included in the line-ups and the order of reserves. Members are welcome to witness the ballot. 2. The ballot for the HKCC game will take place immediately after close of entries on Monday, 22nd July at 2.00 p.m. Rinks line-up will be announced subsequently. 3. The ballot for the CCC game will take place immediately after close of entries on Friday, 2nd August at 2.00 p.m. Members who are successful in the ballot for the HKCC game will have a lower priority. Rinks line-up will be announced subsequently. If you haven’t put down your name on the Entries Form, please do so before the deadline mentioned above. Our groundsman would like us to advise you that renovation work will take place in the recess area adjacent to the indoor green (pictured) between 1st August and 21st August. Noise may be generated as a result. 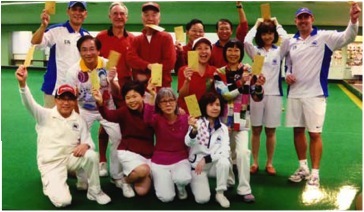 During the period, lawn bowls activitiy can take place as usual. Please be advised that the outdoor green will be closed from 12th July until 8th August for its summer maintenance work so you are advised to plan your outdoor practice and games accordingly. New uniforms have been designed for the new season and will be ready by second half of the premium league game. Each bowler is entitled to three pieces of new uniforms (long or short sleeve depending on choice), design and measurement chart details are enclosed for viewing. Final fitting will take place on Thursday during roll up, members can try out the samples as provided (size S – XL) but XXL is also available for ordering. If members cannot make it, they can refer to the measurement chart to decide what size they want. Click here to download the Mens Size Chart. Deadline to submit 1) your size and 2) # of long or short sleeves is this Friday (19 Apr). Please contact Men’s Captain, Bernard at bernardyounglf@hotmail.com or in person. No fitting session for ladies as the vendor cannot provide samples comparable to our design, so ladies have to refer to the measurement chart. Again deadline to submit 1) your size and 2) # of long or short sleeves is this Friday (19 Apr). Please contact Ladies’ Captain, Daisy at mcnie@netvigator.com or in person. Click here to download Ladies the Size Chart. The sign up sheet for National Singles have been posted on the notice board and the sheet will be taken down by 5 May 2013. If you cannot sign up in person at the Club, please email the Men’s Captain (bernardyounglf@hotmail.com) or the Ladies’ Captain (mcnie@netvigator.com) to sign up on your behalf before the 5 May 2013. The games are expected to kick start on 19 May 2013, in the morning for men and in the afternoon for ladies. The recently completed Skill Enhancement Course run by PT Lee was attended by 16 bowlers and has been very well received with strong support for a repeat/follow up programme to help reinforce what has been learnt. 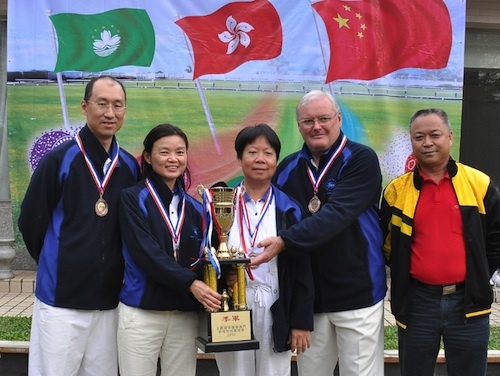 Congratulation to Winne Au, Camilla Leung and Danny Ho in winning the Championship in the Mixed Triples organized by HK Lawn Bowls Association. This is the consecutive year for three of them to win the same title. 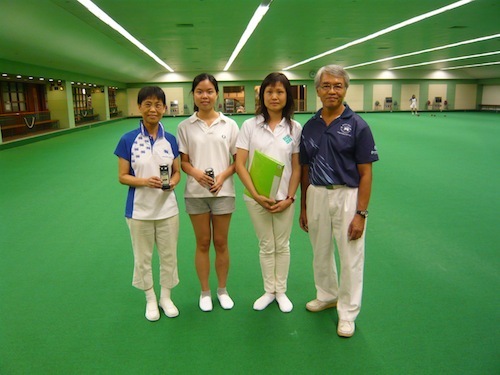 Congratulation to Iris Cheung, Daisy McNie, Dorothy Yu and Connie Wong in winning the National Women Fours organized by HK Lawn Bowls Association. 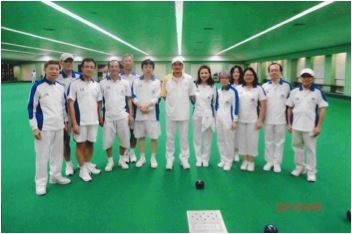 The Section has maintained the tradition to organize a one-day bowling game on the third day of the Chinese New Year. Some 40 members joined in to share the fun and to compete for the trophy named as the Rooster Fat Choy Cup. Overall, it was great fun and a good way to start the new year as there was “laisee” for everyone who attended. 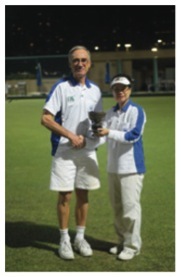 A total of 20 men and 10 lady players joined to compete the Club Outdoor Singles to battle out of the title of Club Lawn Bowls Championships 2012. Games were played during December and January. After rounds of close games, CT Wong won the Men’s Championship and Emmie Wong won the Women Championship. 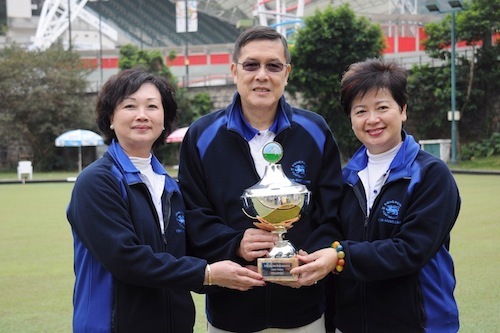 Both of them will represent our Club to compete in the Champion of Champions organized by the HK Lawn Bowls Association. Congratulations to CT and Emmie for their excellent play!! 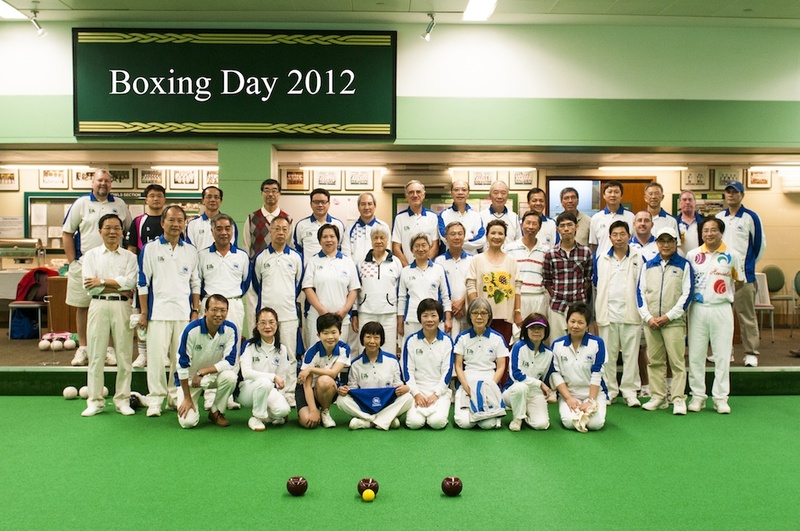 40 bowlers participated in the social game on Boxing Day 2012, and they were divided into 2 groups : the Blues and the Reds. The whole event lasted about four hours, and finally the Blues came out as winners and enjoyed some free drinks. 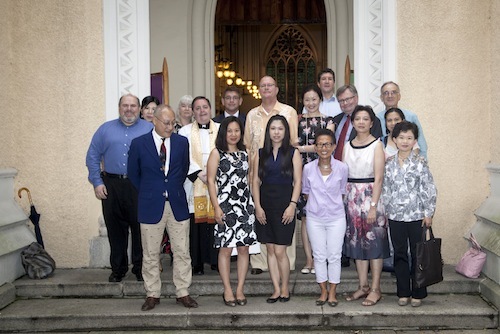 The event was held at the tranquil and beautiful Bijiashan Park in Shenzhen. 28 teams competed in all, with 15 teams from various regions in China, 12 teams from HK and 1 from Macau. 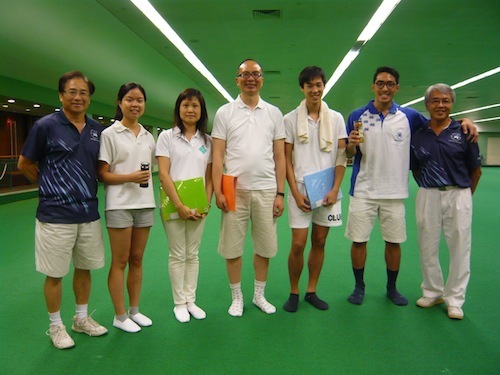 Our club entered 2 teams, Team ‘A’ consisted of Philip and Wanis Sze, Rita Tsui and Harold Low and Team ‘B’ consisted of Nick and Ida Grimshaw, Shirley Ma and Walter Kwok. Team ‘B’ performed very well and entered into the semi-final stage of the competition.